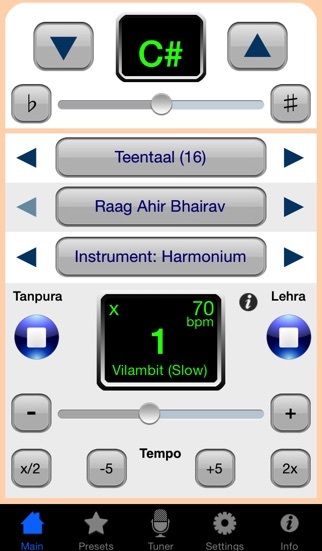 iLehra - Lehra Nagma Player app: insight & download. So you want to play tabla. Got lehra? Well, we have a whole bunch for you! Our Lehra player is just waiting to accompany you. Tired of harmonium lehras? Not to worry, he can also play the violin, flute or Santoor! ◆ Universal app - buy once and run on iPad, iPhone and iPod Touch! ***** "Wow, lehra in my pocket!" ***** "Fantastic, keep up the good work!" ***** "Simple yet pretty interface"
***** "Great concept, EXCELLENT execution"
The Tabla is a percussion instrument widely used in Indian Classical music both as a solo instrument and as an accompaniment to vocal or instrumental music. When played as a solo instrument, the tabla is accompanied (usually on the harmonium or sarangi) by a continuous cyclical musical phrase or riff called the "Lehra" or "Nagma" (ostinato in western music) that keeps track of the "aavartan" or rythmic cycle in the chosen "taal". 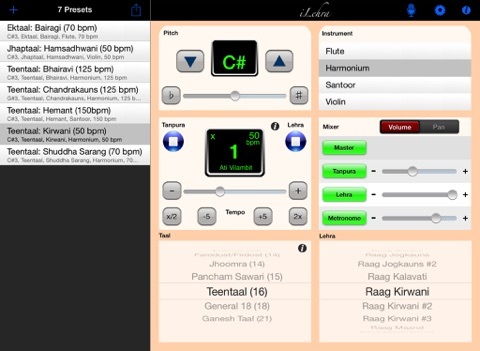 iLehra was the first electronic Lehra / Nagma player for the iPhone and iPod Touch, and its now available on the iPad as well! It provides accurate as well as pleasing lehra accompaniment for a wide variety of taals and raags on the Harmonium, Santoor, Violin, or the Flute. Innovative features include tanpura auto-tuned to the chosen lehra/raag, presets, tap-tempo, metronome, and extremely intuitive controls. √ Taals included: Ada Chautaal(14), Basant Taal(9), Chartal-ki-Sawari(11), Chautaal(12), Dadra(6), Deepchandi(14), Dhamar(14), Ektaal(12), Faradost/Firdost(14), Ganesh Taal(21), Jhaptaal(10), Jhoomra(14), Keherva(8), Matta Taal(9), Pancham Sawari(15), Rudra Taal(11), Rupak(7), Sooltaal(10), Teentaal(16), as well as general lehras for 7.5, 8.5, 9.5, 10.5, 13, and 18 beats. √ Beautiful, realistic lehras on Harmonium, Violin, Flute, or Santoor! √ TAP TEMPO: just tap the beats on the bottom display and watch iLehra sync up! √ PRESETS: save your frequently-used combinations of pitch, taal, lehra, instrument & tempo as named presets. And now you can also export/import presets via email or iTunes File Sharing. √ Can be used with speakers, headset, or the internal speaker. A high-quality speaker dock or bluetooth speaker is recommended for maximum effect.